Barbeque (HK people call it 'BBQ') / Roasted pork, ribs, duck are always one of our favourites choices during meals as they can serve together perfectly with rice or noodles or even spagetti in soup. 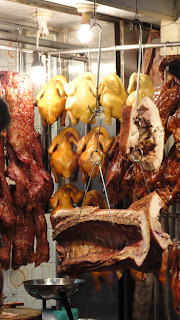 They all have a common characteristic of crispy skin with a unique sauce. I just know the sauce is made with honey so the Roasted meat skin is a bit sweet while the meat inside is salty and tender. You can feel the mixture of crispy and tender together when you eat them. There are some restaurants especially selling them or you can also in HK style ''Tea cafe'' 茶餐廳 and some local Cantonese cuisine. The price range is from 30hkd to around a hundred depending on what kind of restaurant you are in.